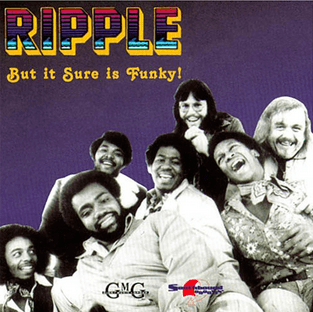 Ripple is an American funk band from Michigan. 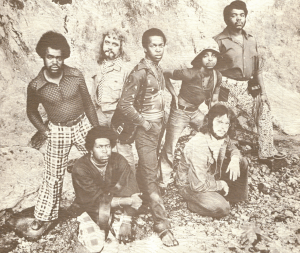 The group was signed to GRC Records and in the 1973, and scored several hit singles, the biggest of which were “I Don’t Know What It Is, But It Sure Is Funky”. Their signature “Oh-la Oh-la Ay” chant has been incorporated into numerous legendary pop, rap, and hip-hop hits. “Willie Pass The Water” and “Funky Song” were also hits for the group upon original release and have since been widely sampled. But It Sure Is Funky! Products "But It Sure Is Funky! "-"Ace Records"-"2011"-"CDSEWD098"-"6"
Products "But It Sure Is Funky! "-"Ace Records"-"2011"-"CDSEWD098"-"7"
Products "But It Sure Is Funky! "-"Ace Records"-"2011"-"CDSEWD098"-"19"
Products "But It Sure Is Funky! "-"Ace Records"-"2011"-"CDSEWD098"-"17"
Products "But It Sure Is Funky! "-"Ace Records"-"2011"-"CDSEWD098"-"20"
Products "But It Sure Is Funky! "-"Ace Records"-"2011"-"CDSEWD098"-"16"
Products "But It Sure Is Funky! "-"Ace Records"-"2011"-"CDSEWD098"-"9"
Products "But It Sure Is Funky! "-"Ace Records"-"2011"-"CDSEWD098"-"12"
Products "But It Sure Is Funky! "-"Ace Records"-"2011"-"CDSEWD098"-"4"
Products "But It Sure Is Funky! "-"Ace Records"-"2011"-"CDSEWD098"-"10"
Products "But It Sure Is Funky! "-"Ace Records"-"2011"-"CDSEWD098"-"14"
Products "But It Sure Is Funky! "-"Ace Records"-"2011"-"CDSEWD098"-"1"
Products "But It Sure Is Funky! "-"Ace Records"-"2011"-"CDSEWD098"-"13"
Products "But It Sure Is Funky! "-"Ace Records"-"2011"-"CDSEWD098"-"18"
Products "But It Sure Is Funky! "-"Ace Records"-"2011"-"CDSEWD098"-"15"
Products "But It Sure Is Funky! "-"Ace Records"-"2011"-"CDSEWD098"-"22"
Products "But It Sure Is Funky! "-"Ace Records"-"2011"-"CDSEWD098"-"21"
Products "But It Sure Is Funky! "-"Ace Records"-"2011"-"CDSEWD098"-"2"
Products "But It Sure Is Funky! "-"Ace Records"-"2011"-"CDSEWD098"-"11"
Products "But It Sure Is Funky! "-"Ace Records"-"2011"-"CDSEWD098"-"5"
Products "But It Sure Is Funky! "-"Ace Records"-"2011"-"CDSEWD098"-"8"
Products "But It Sure Is Funky! "-"Ace Records"-"2011"-"CDSEWD098"-"3"